Cube 3D printers now available for pre-order! 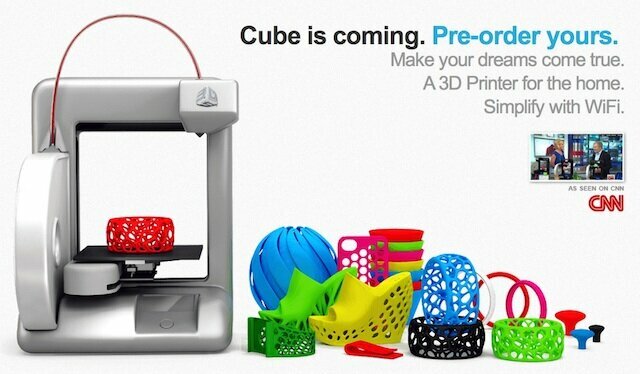 The much-anticipated Cube 3D printer is now in pre-order status at Cubify.com! Unlike most other home/hobbyist 3D printers, this $1299 unit simply looks ultra-hip and cool, attractive enough to place in any room of your home — no need to force this one to live in the garage. And it’s as simple as can be to use — it’s fully assembled, just plug it in and use it. If you think you want one of these babies, get in the queue quickly, by heading over to the Cube’s home, Cubify.com, and place your pre-order. No word on when the first unites will ship though. The sleek, wifi-enabled Cube 3D Printer is only 10 x 10 x 13 inches in size, and weighs in at just 9.5 lb, with a max printed object size of 5.5 x 5.5 x 5.5 inches. Currently, there are ten vibrant colors of ABS printing material that come in convenient cartridges. The company says each cartridge can print 13 to 14 mid-sized models. A single cartridge is $49, but you can get a pack of six for $219. One big drawback though: Windows is required. Ugh. Sorry Mac users. For those families that can afford it, I think this is going to be the hot gift next Christmas.